Conquer Club • View topic - Atlas Shrugged 3 - CO-STARRING RON PAUL!!! Atlas Shrugged 3 - CO-STARRING RON PAUL!!! Wow, you guys sound so bitter. Don't be resentful because I used money I earned working at a grocery store in high school to play the financial markets effectively. Phatscotty wrote: I've seen zip from Dave to even begin to wonder how qualified he might or might not be. He says he has a degree, but everyone has a degree here right? Didn't want to let this one slip, but I'm not going to do that whole "parse every single line of a post and make a huge long reply" thing that is a glaring sign of low intelligence (or sleep deprivation). Anyway, it doesn't matter what I were to show you, Phatsco, you'd never be impressed anyway. Last edited by pimpdave on Thu May 19, 2011 10:56 am, edited 3 times in total. You know, one of the most successful hedge fund managers in the world is a neurologist. pimpdave wrote: Wow, you guys are bitter. Don't be bitter because I used money I earned working at a grocery store in high school to play the financial markets effectively. Didn't want to let this one slip, but I'm not going to do that whole "parse every single line of a post and make a huge long reply" thing that is glaring sign of low intelligence. Even Anthony Weiner tried to scare people out of gold at $800. I pity the fool that listened to Anthony Weiner. And it just proves the point that no matter what I reveal about myself, you'll try to use it to undermine anything I say anyway. The only tip I've given any of you is that gold is overvalued at this point. If it keeps going up at this point, it's too high to be worth buying any more because it's going to come back down. Why you think that means I don't hold any gold at the moment underscores my point above yet again. Finally, and most importantly, I'm not out to take all of the money in the world for myself. I have enough to get by. And I live very simply. That's all I really need. I don't mind paying my taxes at all and won't mind if they go up because I love this country and I want it to do better. You guys are all sounding really selfish and bitter. Last edited by pimpdave on Thu May 19, 2011 10:59 am, edited 2 times in total. I didn't know that. Interesting. I suppose we're done now. Talk to you later. is that basically the same as saying the dollar is going to go up, since gold/dollar act inversely? If that is the case, why do you think the dollar will go up? The Tea Party Death Squad? thegreekdog wrote: Shockingly, it appears that you have not read any of my posts with respect to raising taxes on the rich. One might say you're ignorant about my viewpoint. You mean, Glenn Beck the morning zoo DJ who got famous by saying inflammatory things on television? Yeah, he sounds qualified. Yeah, believe it or not it's possible to study more than one thing. So you finally admit that the Tea Party Death Squads exist? whats your fav site for getting quotes? Capitalism! Quick! HIDEEEEEEEEEE! Someone is promoting a product! Oopsie! They might actually sell more products because of this, resulting in increased shifts at the manufacturing plant and increased orders for part from other states around the country and sales taxes all the way around baby! Wow, talk about a defensive reaction. Did I hit a nerve or what? natty_dread wrote: Wow, talk about a defensive reaction. Did I hit a nerve or what? No. it was more like a juicy fastball right across the center of the plate. The internet street fight rages on. 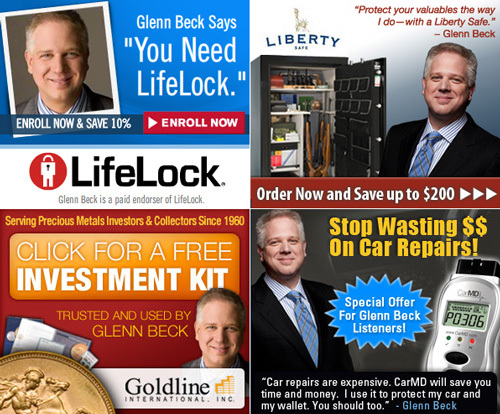 Glenn Beck hates free market enterpreneurs. New theaters announced in AZ, CA, GA, ID, IL, KY, MI, NH, OR, and WA. Phatscotty wrote: New theaters announced in AZ, CA, GA, ID, IL, KY, MI, NH, OR, and WA. You're going offthe new topic... I think. And tgd, after reading the last three pages I think pd is more qualified to talk about schools of economics than you are. not surprised that you think that. but who is more qualified to talk about economics itself? john9blue wrote: not surprised that you think that. but who is more qualified to talk about economics itself? Greek has displayed pages and pages of econ posts, not even getting into right or wrong. I have maybe seen one post from Dave in an attempt to get all economic on someones azz. By that logic, the village idiot is the smartest person in town, because he's always running his mouth. Oh wait, my bad, didn't mean to give any credibility to Glenn Beck like that.